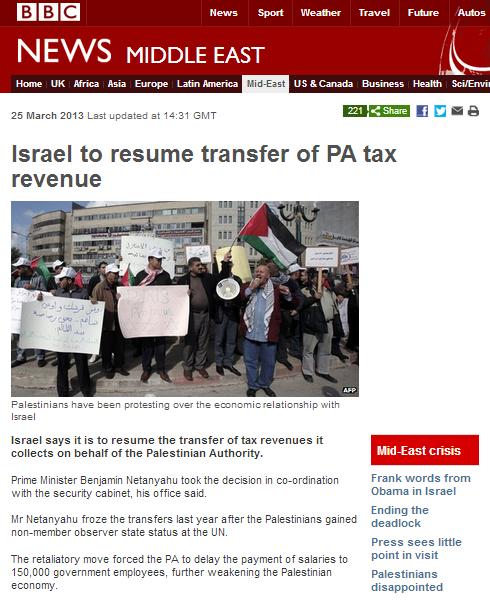 On March 25th the BBC published an article on the Middle East page of its website entitled “Israel to resume transfer of PA tax revenue“. The word “resume” is defined as meaning “to begin or take up again after interruption” and so its use in this BBC headline would naturally suggest to reasonable readers that there had been a break in the monthly transfers of tax revenues collected by Israel to the Palestinian Authority. The question is therefore; is that choice of wording an accurate representation of the situation? At the beginning of December 2012, the former Israeli Minister of Finance announced that he would not transfer to the PA the sum of 460 million shekels due in tax and customs revenues which Israel collects on behalf of the PA under the terms of the 1994 Paris Protocol – the chapter of the Oslo Accords dealing with financial affairs. Although members of the press – both domestic and foreign – were quick to label that announcement as being ‘punishment’ for the PA’s breach of the Oslo Accords in the form of its bid for UN observer status, that factor was not mentioned by Minister Steinitz. At the time, the Palestinian Authority was in arrears to the tune of some 800 million shekels to various Israeli bodies, including the Israeli Electric Corporation, to which it owed the vast majority of that sum for electricity already consumed in PA-controlled areas and the Gaza Strip. In January 2013 Israel transferred the sum of $100 million from the December 2012 revenues to the PA – as the BBC itself notes in the above report. In February 2013 the revenues for January and February were transferred to the PA. Hence, any ‘break’ in revenue transfers would be more accurately described as a delay at most, including the sum intended to be used to pay off part of the PA’s considerable debt to the Israeli Electric Corporation. 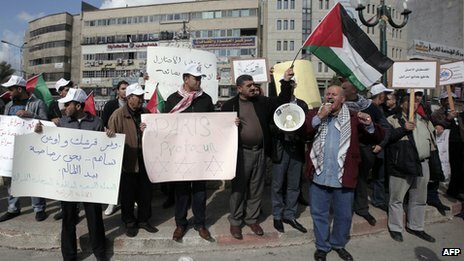 What the BBC neglects to tell its audiences in this article is that the American pressure applied upon Israel to come up with a ‘goodwill gesture’ in the form of the transfer of revenue arrears to the PA includes that sum set aside last December, meaning that the Palestinian debt to the IEC currently stands at 730 million shekels. Negotiations with the PA to come to an arrangement on payment of the arrears have failed to yield results and the IEC now apparently considers that it has little hope of recovering that debt. Reportedly, the IEC now seeks to make up that serious shortfall in income by requesting permission from the electricity ombudsman for an increase of some 3% on the tariffs paid by Israeli consumers. But of course the story of the possibility of Israelis paying for their neighbours’ electricity is not one we are likely to see reported by the BBC. 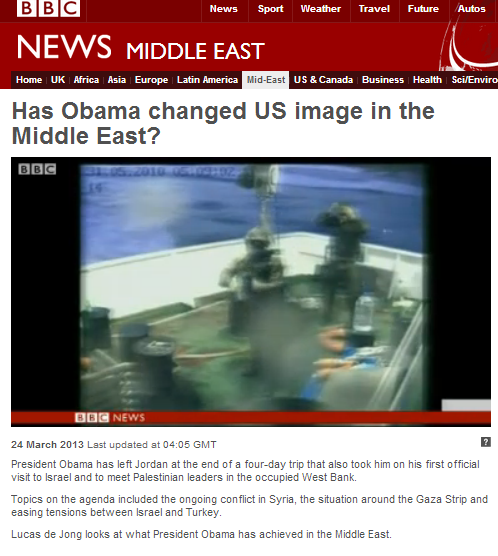 Another notable feature of this report is the picture selected by the BBC to illustrate it – together with its caption. That, of course, reflects the fact that the subject of economic arrangements between Israel and the Palestinian Authority, as well as the PA’s economic situation as a whole, is not infrequently used for both domestic and foreign political purposes. Interestingly, the BBC appears to be keen to promote the long employed PA narrative of its proverbial impending economic collapse being exclusively due to Israeli actions, despite the lack of fact-based evidence for such claims and the existence of other factors such as recurrent donor shortfalls. Concurrently, the BBC meticulously avoids informing its audiences of instances of the Palestinian Authority’s dubious financial management – for example its practice of spending over 6% of its budget on paying salaries to imprisoned terrorists and the families of suicide bombers or the recent universal electricity bill amnesty. Telling half a story is not compliant with the BBC’s obligations to accuracy and impartiality. Almost a week after their announcement, there has so far been no report published by the BBC regarding the new restrictions on foreign journalists introduced by the Palestinian Authority’s Ministry of Information and the Fatah-controlled Palestinian Journalist’s Syndicate. “Foreign journalists who ignore the latest restriction face arrest by Palestinian Authority security forces, said Jihad Qawassmeh, member of the Palestinian Journalist’s’ Syndicate. “The Palestinian Authority, which has often displayed a large degree of intolerance toward journalists who refuse to serve as a mouthpiece for its leaders, wants to work only with sympathetic reporters. As anyone who has read Stephanie Gutmann’s “The Other War” (a riveting account of the reality behind the foreign media’s reporting of the Second Intifada) will be aware, information coming out of the PA-controlled territories via foreign correspondents already passes through a series of ‘sieves’ including fixers and local editors before it reaches the general public. This new dictate by the PA will clearly exacerbate the filtering of the news which reaches audiences worldwide. “Particularly disturbing is that representatives of the international media have not protested against the Palestinian Authority’s threat to restrict the journalists’ work and even arrest them. One can only imagine the response of the international media had the Israeli authorities issued a similar ban or threat. It also remains to be seen whether human rights organizations and groups that claim to defend freedom of press will react. So far at least, the BBC appears to be avoiding informing its audiences of these new measures which will affect both the accuracy and impartiality of its reporting. Similarly, the Foreign Press Association – chaired by the BBC Jerusalem Bureau’s Paul Danahar – has yet to release a statement on the subject. 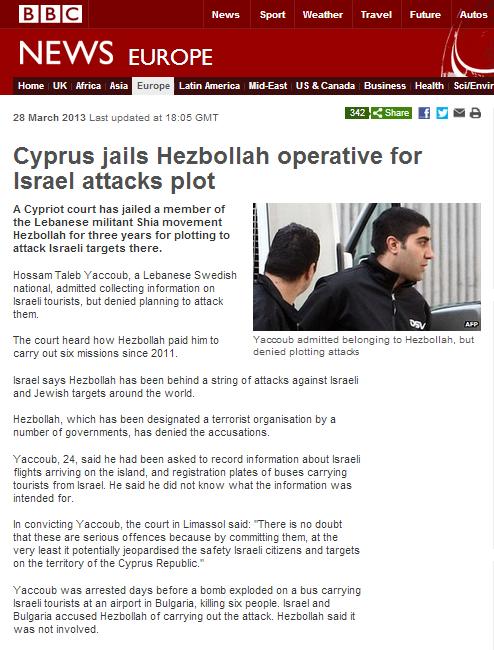 With the recent sentencing of Hizballah operative Hossam Taleb Yaacoub by a court in Cyprus, the BBC has finally broken its long silence on the subject of that trial. A short report appeared on the Europe and Middle East pages of the BBC News website on March 28th, stating that Yaacoub had been sentenced to three years imprisonment, although other media outlets report a four year sentence being handed down. The BBC report – true to form – continues to euphemistically describe Hizballah as “the Lebanese militant Shia movement”. Laconic as it is, the article also manages to include some remarkable contortions and distortions – presumably inserted in the name of “impartiality”. Of course Israel is far from the only country to recognize Hizballah’s long-standing connections to terrorism, but the BBC seems to be trying to imply otherwise, as well as appearing to wrongly suggest that Hizballah activity is confined to attacks on “Israeli and Jewish targets”. In other words, the BBC juxtaposes the results of investigations into Hizballah’s terrorist and criminal activities, carried out by various countries and international bodies, with predictable denials from the terrorist organization itself – as though they were of equal weight. The BBC’s contrived show of ‘impartiality’ with regard to this terrorist organization are a sinister product of its warped interpretations of the term “value judgements” – interpretations which are ultimately detrimental to BBC audiences’ understanding of the issues. 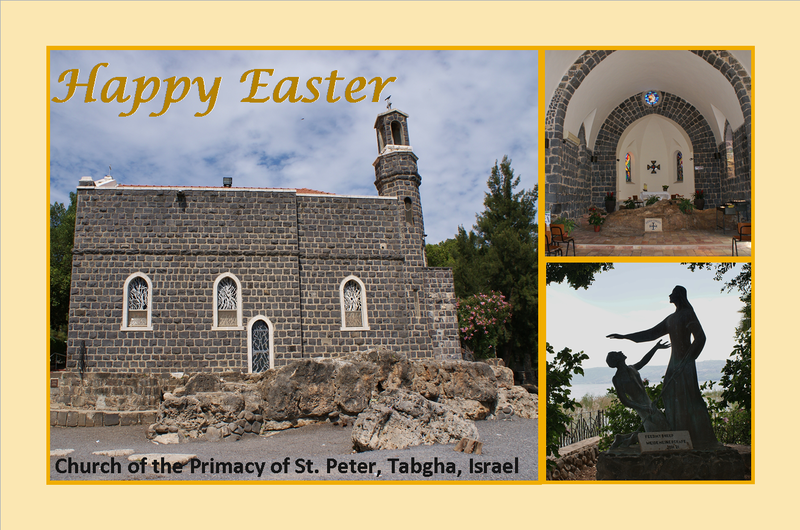 Wishing all our Christian readers a Happy Easter. 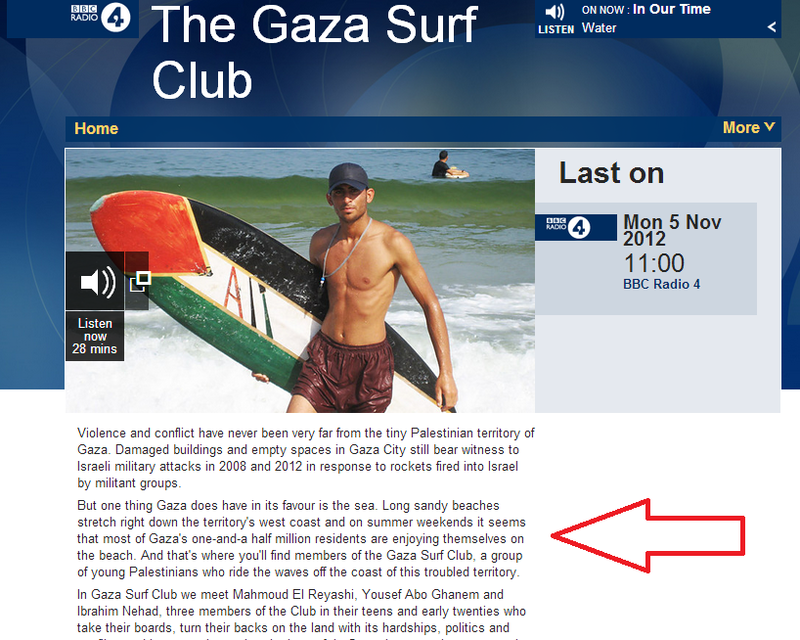 Readers may remember that last November the BBC broadcast what it categorised as a documentary about the Gaza Surf Club on BBC Radio 4. “…the statement “few Gazans are able to leave the territory or to import and export goods” doesn’t accurately reflect the current situation”. 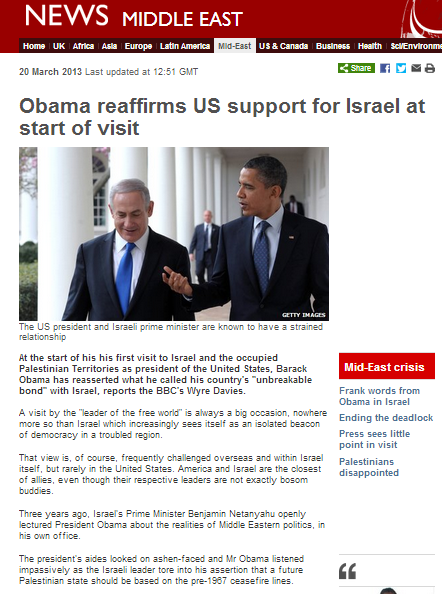 Among the reams of BBC coverage of the recent visit by Barack Obama to Israel was this article written by Wyre Davies of the BBC Jerusalem Bureau on March 20th 2013. “A visit by the “leader of the free world” is always a big occasion, nowhere more so than Israel which increasingly sees itself as an isolated beacon of democracy in a troubled region. But it is the next part of Davies’ report which provides an excellent example of how a specific narrative can be crafted through omission. “Three years ago, Israel’s Prime Minister Benjamin Netanyahu openly lectured President Obama about the realities of Middle Eastern politics, in his own office. Davies is in fact referring back almost two years – to May 20th 2011 – the first day of a five-day visit by Israel’s prime minister to the United States. But what he neglects to mention is that on the previous day, as Netanyahu was about to embark on the journey to Washington, Obama delivered a speech of his own in which he stated that a future Palestinian state should be based on what he termed “the 1967 lines” – or as they are more accurately described; the 1949 Armistice agreement lines. For Israelis – only too aware of the indefensible nature of those armistice lines and the fact that just eighteen years after they were drawn, Israel yet again faced the threat of annihilation from its neighbours – Obama’s declaration was seen as an American adoption of the Palestinian viewpoint, a hindrance to negotiations and back-tracking on the commitments made by Obama’s predecessor in 2004. “I think for there to be peace, the Palestinians will have to accept some basic realities. 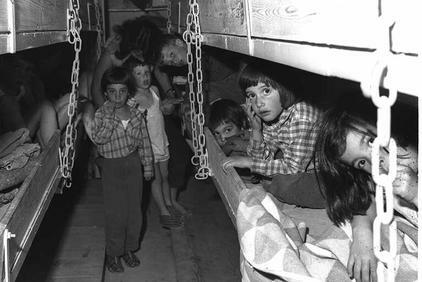 The first is that while Israel is prepared to make generous compromises for peace, it cannot go back to the 1967 lines — because these lines are indefensible; because they don’t take into account certain changes that have taken place on the ground, demographic changes that have taken place over the last 44 years. Wyre Davies, however, neglects to inform his readers of the context to Netanyahu’s words, instead reducing them to the superficial category of a spontaneous ‘lecture’ “in his own office”. Of course for readers to take something from Davies’ jaundiced account beyond the impression of Israeli rudeness (and worse) which he so deftly weaves, that context is vital. The failure to provide it can only be viewed as an attempt to shape a specific political narrative. Consider this filmed report from March 24th by Lucas de Jong which appeared on BBC television news programmes as well as on the BBC News website. 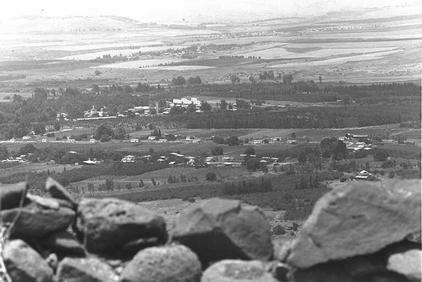 However, as previously noted here, PM Netanyahu’s apology did not relate to the fact that a “commando raid” took place – as de Jong claims – but to “any mistakes that might have led to the loss of life or injury” and it was made not “to Turkey”, but specifically to the Turkish people. De Jong’s complete failure to inject any context whatsoever into this section of his report, together with his selective omission of crucial facts, means that viewers unfamiliar with the actual sequence of events are left unaware of the severe violence perpetrated against the Israeli soldiers by the well-prepared mob of religiously inspired Turkish nationals and of the fact that the soldiers acted in self-defence. Neither are viewers made aware of the fact that the purpose of the “Gaza-bound flotilla” was to breach a legal maritime blockade initiated in order to curb the flow of weapons to the terrorist group Hamas, with which organisers of the flotilla – including the owners of the ship upon which the incident took place, the IHH – are affiliated. This additional example of inaccurate and context-free reporting on the subject of the Mavi Marmara incident indicates yet again that the BBC is more interested in manipulating audiences’ recollections of that event through distortion of the facts than in accurate and impartial reporting in accordance with its obligations. 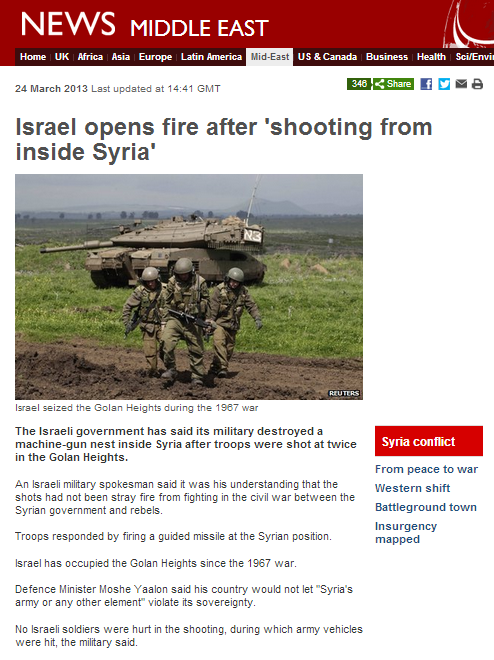 As previously noted here not long ago, the BBC’s selective reporting on the subject of the growing number of cross-border incidents along the Israeli-Syrian frontier in the Golan Heights is not as erratic as it may at first seem. Shelling and shooting into Israel, such as the incident at Alonei HaBashan in late February or the one at Ramat Magshimim in early March, received no attention from the BBC. 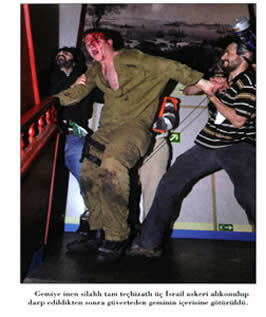 On March 23rd shots were fired at an Israeli patrol along the border in the late evening. That incident was also not initially reported by the BBC. On Sunday, March 24th, another incident occurred near Tel Fares, and this time the IDF responded. 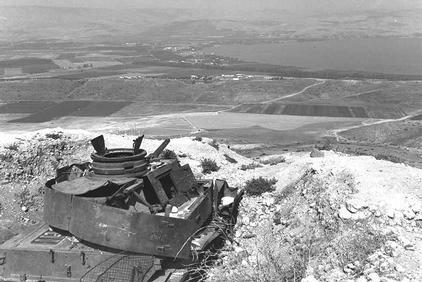 That response prompted the appearance of a short report on the BBC News website in which it was seen fit to remind readers twice that “Israel seized the Golan Heights during the 1967 war” and “Israel has occupied the Golan Heights since the 1967 war”. The fact that the BBC apparently elects to report only on incidents to which Israel responds means that BBC audiences are receiving a partial picture of the situation along that border and – as has similarly been the case with the BBC’s selective reporting of incidents along the border with the Gaza Strip – that crucial context is eliminated from audience understanding.